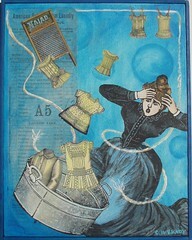 Art Journal: Marcel Proust had an haddock! 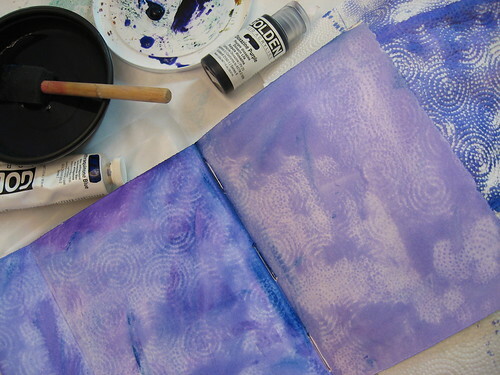 Let the Art Journaling Commence! Julie Balzer did an interesting post for Art Journal Every Day this week showing how one of her art journal layouts evolved over the course of several days. 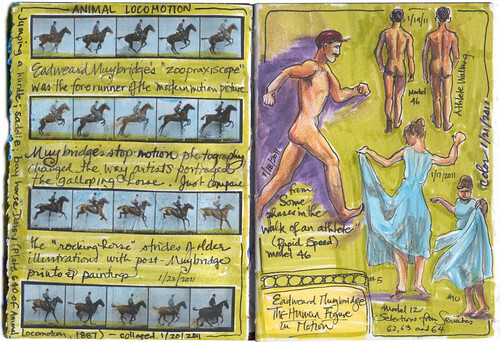 My journal spread above started on the right page with the black & white sketches I did on three different days, using Eadweard Muybridge's book The Human Figure in Motion for reference. Then after staring at the blank left page one night, I printed out and glued in the sequence of the horse Daisy jumping a hurdle, from Muybridge's Animal Locomotion . The next day I added color using Letraset markers, and today I filled in empty space with text. When he first showed these photos to the public, many people did not believe they were real! Now we take this imagery for granted, because Muybridge changed the way we see the world. If you're interested in learning more about him, check out Stephen Herbert's website The Compleat Muybridge or read Rebecca Solnit's fascinating book River of Shadows: Eadweard Muybridge and the Technological Wild West . 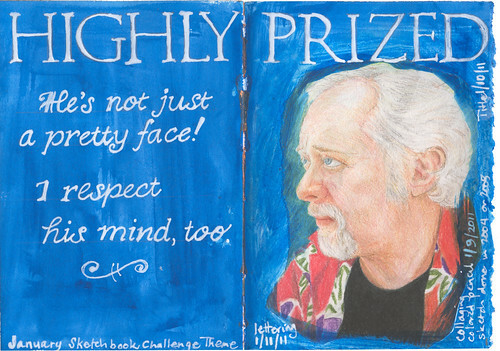 The Sketchbook Challenge theme for January is "Highly Prized," chosen by Jill K. Berry (whom I was fortunate to take a workshop from in 2009). 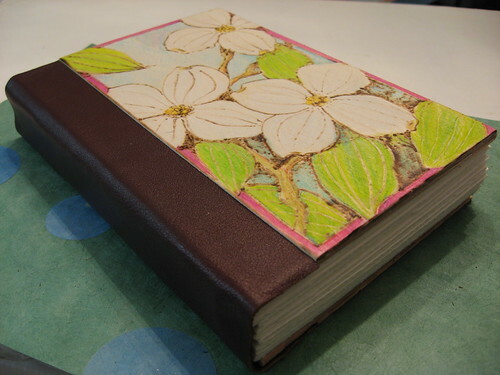 As part of my quest for inspiration, I'm also signed up for Strathmore's free on-line workshop "Recycled Journal Pages" taught by Pam Carriker, which explores among other things, using art you already have on hand in your journaling. In my on-going struggle to clean my office, I rediscovered a colored pencil sketch I made of my husband several years ago, and I collaged it into my art journal so it wouldn't get lost again! At the time, I was on a serious colored pencil kick and working with Ann Kullberg's book Colored Pencil Portraits , but I learned I really don't have the patience for the medium. The problem with portraiture is that the facial recognition software in our brains is so precise that one slip of the pencil can turn a family member's face into a stranger's! That's why I tend to fall back on photography and vintage clip art for human imagery in my art. But I'm trying to get some more practice in this year. 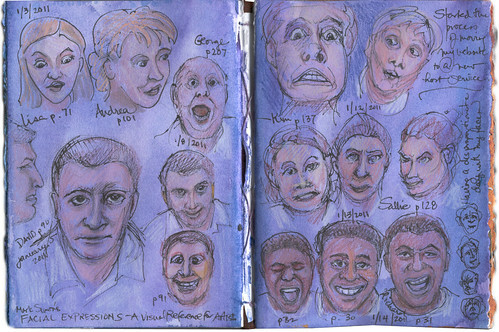 On those days when I realize around 9 p.m. that I haven't done my art journal entry, I pull out Mark Simon's Facial Expressions and sketch a few faces. Lyric Kinard posted a tutorial video on drawing faces on the Sketchbook Challenge blog. She's doing 365 Faces this year. Now that's a challenge! 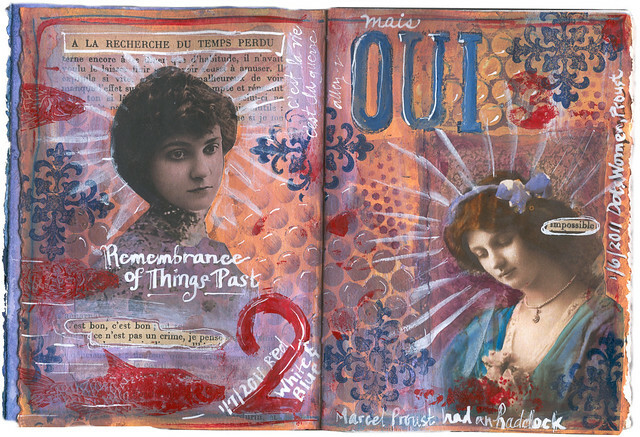 This spread started with the photos of two women printed from the Ten Two Studios Edwardian Beauties image CD and some vintage French text from Marcel Proust's A la Recherche du Temps Perdu (usually translated as Remembrance of Things Past in English or more literally, In Search of Lost Time). 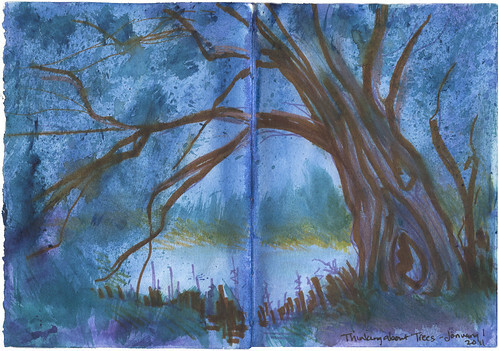 I figured I'd start the year off with a bang by doing a full-page spread on January 1 with a sketch of a willow tree I had photographed several years ago, done in marker, acrylic paints, colored pencil and a bit of Souffle pen (basically whatever was in reach). I've been thinking about making some ATCs for a tree swap at Illustrated ATCs but hadn't gotten my act together, and I'd also thought about doing some bare trees for the Milwaukee ATC group's January theme "Winter" so this page is titled "Thinking About Trees." I don't plan to do a full spread everyday. Having done several 365 projects now, I've learned to keep my expectations low, and I'll be happy if some days all I do is doodle a bit. I'm also not planning to do the pages in order, so the past few days I've been jumping back and forth between two spreads. "Snow" is mostly complete now, though it looks unfinished in the scan because the shiny embossed snowflakes don't show up very well. 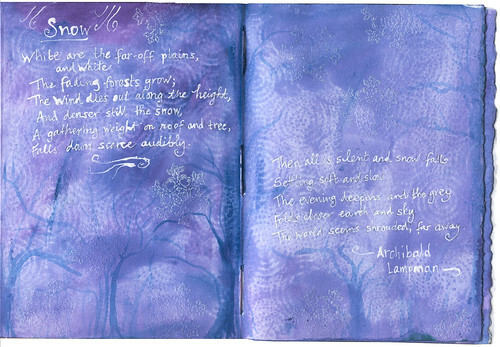 Also there's a little foldout tab on the left side that didn't fit on the scanner bed where I noted the progress of this spread: writing out excerpts from Archibald Lampman's poem Snow in white acrylic ink with a dip pen on January 2, and then stamping & embossing the snowflakes and adding tree shapes with a thin brush and acrylic wash on January 4. This was inspired by Loreena McKennitt's song based on this poem, which was going through my head despite the fact that we've had very little snow this winter. 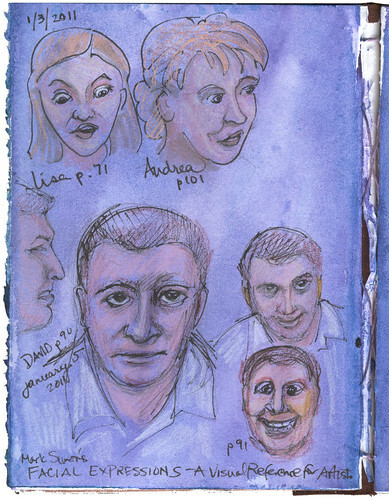 I've also been filling a spread with little sketches of faces from Mark Simon's Facial Expressions: A Visual Reference for Artists in ink and colored pencil. As you can see by the right side of the page, my lack of bookbinding practice means my current stitching might not last the year. We'll see! If you see less than 365 photos, that's because a few photos are only visible to friends and family. My family's like me - we don't like having our photos taken, much less posted on the internet. So you'll see very few self-portraits in this set! And I suspect a large percentage of the photos are still-life set ups taken after 9 p.m., when I realized I needed to take a photo before I went to bed. This project served more as a documentation of my creative life (after two previous failed attempts to do Crafting 365), so there are a lot of photos of art projects and supplies. OK, there are quite a few photos of food as well. And cats. I'm not sure how the binding & wooden cover will hold up, but there's only one way to find out. Fortunately (and not due to any foresight on my part), I chose paper that was meant for printmaking, so it's fairly thick and sturdy and will hold up to paint & markers and who knows what else! I don't expect to do something fabulous every day. My goal is to at least make some marking once a day, even if it's only laying down a wash of color, collaging an image, or doodling in a corner. So let the New Year begin!